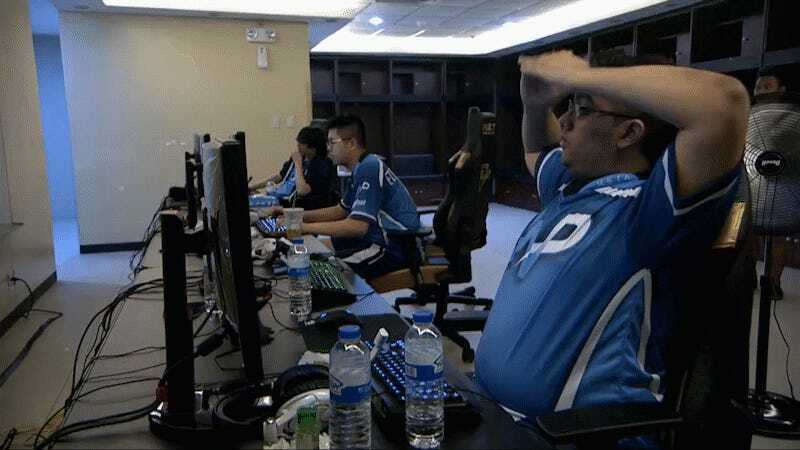 Jacky “EternaLEnVy” Mao, captain of Team NP, was coming off a loss in the team’s first game at the Dota 2 Manila Masters when even gravity seemed to let him down. During a break between games one and two, as both teams went over strategy and drafts for the coming, likely decisive contest, Mao got a little tilted and ended up on the floor. Nearby teammates Kurtis “Aui_2000" Ling and Arif “MSS” Anwar seemed unfazed by this development. Though NP took game two off opponent OG, NP lost game three in a 51-minute slugfest and will face Team Secret in an elimination match tomorrow. No word on whether the chairs will remain wheeled leading into the set.